In January 2016, the average sale price of a residential home was $265,000. This fluctuated throughout the year (for example February was $298,623 and July was $272,485) but it settled at $264,745 in December, very similar to the start of the year. It’s up just over $4,000 from December 2015. Overall, the dollar amount of year-to-date sales for 2016 are strikingly similar to 2015. The announcement of the AltaGas propane export facility was a positive way to start the year. This leaves us wondering what 2017 will bring … only time will tell! If you have any questions or want to discuss, don’t hesitate to contact one of us. Mike @ 250.600.6620 or Nikki @ 250.600.4650. 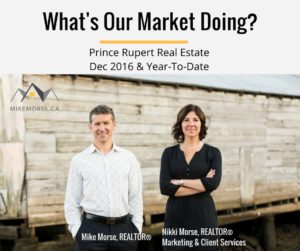 The stats are based in whole or in part on information supplied by the BC Northern Real Estate Board for the period January 1, 2015 through December 31, 2016.